Asian Honey Lemon Shrimp – this is the easiest, most delicious sweet and tangy shrimp and you can make it on the grill or stovetop! and the Honey Lemon Chili Butter Sauce is out of this world! Easy Honey Garlic Shrimp exploding with flavor and on your table in less than 30 minutes! This Honey Garlic Shrimp is the perfect quick and easy dinner for all those busy weeknights BUT it’s also delicious enough for company! It takes less than 30 minutes to make and 20 of those minutes is hands-off marinating time. All you have to do is whisk the honey lemon garlic butter sauce together and cook the shrimp! The flavorful sticky sauce doubles as the marinade so you get double the flavor without double the work. This Honey Garlic Shrimp is sweet, savory, spicy and buttery with an Asian garlic, ginger kick. I’ve included directions on how to grill this shrimp recipe or cook it on the stovetop because you are going to want to cook this juicy shrimp year round. Serve Honey Garlic Shrimp as an appetizer or as a dinner with rice and vegetables or make a shrimp salad out of it. No matter how you serve it, your family will LOVE this Honey Garlic Shrimp recipe! Shrimp never ceases to amaze me at just how easy it is to make, let alone quick to cook! If only it were as inexpensive as chicken, and if only my husband wasn’t allergic to it, I would eat shrimp every day. But for all those NOT allergic to shrimp and ready for either a crowd pleasing appetizer or super easy family pleasing meal, I bring you Honey Garlic Shrimp! I adapted the plate licking sauce from my Honey Lemon Ginger Chicken and added Asian Chili Paste to balance out the spices not used from the chicken breading. So we have sweet honey, tangy lemon, grounded soy, spicy Asian chili paste, creamy butter all seasoned with a kick of ginger and garlic AKA we have otherwordly delicious Honey Garlic Shrimp! 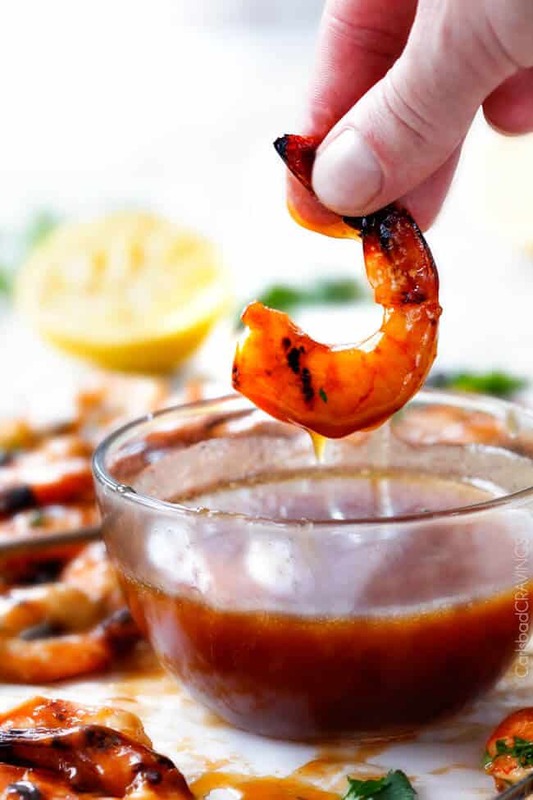 This honey garlic sauce not only serves as the marinade, but as the sauce as well because if we are going to make shrimp, we might as well splurge and make it the best shrimp ever. Now we have Honey Garlic Shrimp seeping with flavor through and through bathed in sticky honey garlic sauce. Honey Garlic Shrimp uses pantry friendly ingredients so you can make it at a moments notice! honey: ½ cup might seem like a lot but it is balanced by all the rests of the ingredients. minced garlic: you can substitute fresh garlic with one teaspoon ground. fresh ginger: this recipe only uses 1 ½ teaspoons fresh ginger so you may substitute it with ½ teaspoon ground. I think fresh ginger tastes much better though, so here are a couple tips: you don’t have to purchase the entire root, just snap off an inch. Alternatively, peel and grate or mince all your ginger then freeze it in one teaspoon quantities wrapped in parchment paper then stored in a plastic bag OR you can just snap off what you need. lemon juice: you can use fresh or bottled lemon juice. rice vinegar: use unseasoned rice vinegar for best results. Asian chili paste: I use Sambal Oelek but you can also use sriracha, just be aware you may need more or less as different chili sauces vary in heat. butter: you can use more or less depending on how decadent you would like your Honey Garlic Shrimp. WHAT SHRIMP is best for Honey Garlic Shrimp? I always purchase my shrimp in the frozen section at Costco. It comes frozen, shelled and deveined so all that’s left to do is defrost the shrimp. The shrimp bag at the grocery store will indicate if the shrimp is deveined or not. You want to purchase deveined if possible because then its one less thing you have to do! I recommend cooking your shrimp with the tails on because the tail shells contain flavor that seeps out and we get more robust shrimp flavor. Once your shrimp is cooked and resting you can remove the tails if you desire. What type of pan should I use to cook the shrimp? Normally you an cook shrimp in any pan but for this Honey Garlic Shrimp, you will need to use either a nonstick skillet or a well-seasoned skillet or wok otherwise the honey and shrimp will stick to the pan and you will be left peeling shrimp off of the pan. Can I prep any of this in advance? You can prep your shrimp by either cleaning it or defrosting it. You can whisk your sauce together in advance EXCEPT the honey and store it in an airtight container in the refrigerator. Don’t add the honey until you’re ready to use the sauce or else it will harden in the refrigerator. You can chop any veggies beforehand and then store them in an airtight container in the refrigerator or simply chop while your shrimp is marinating. You can start steaming your rice while the shrimp is marinating. 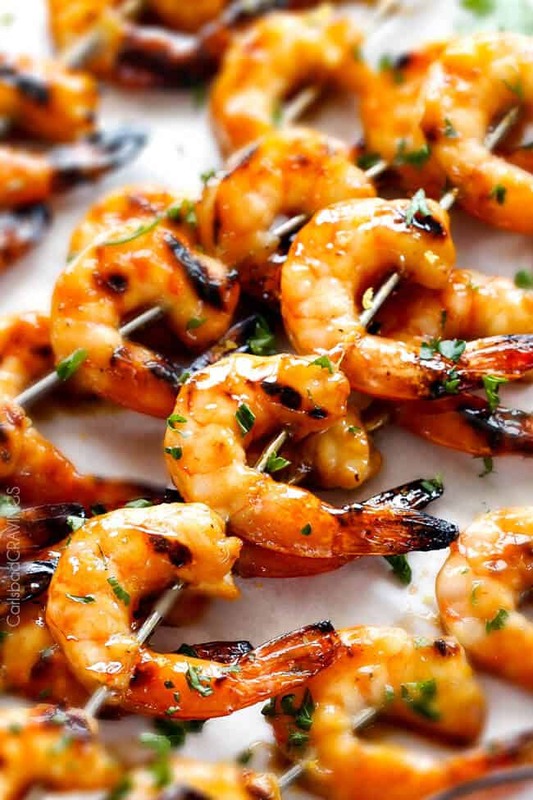 You can Make Honey Garlic Shrimp on the grill or the stovetop. 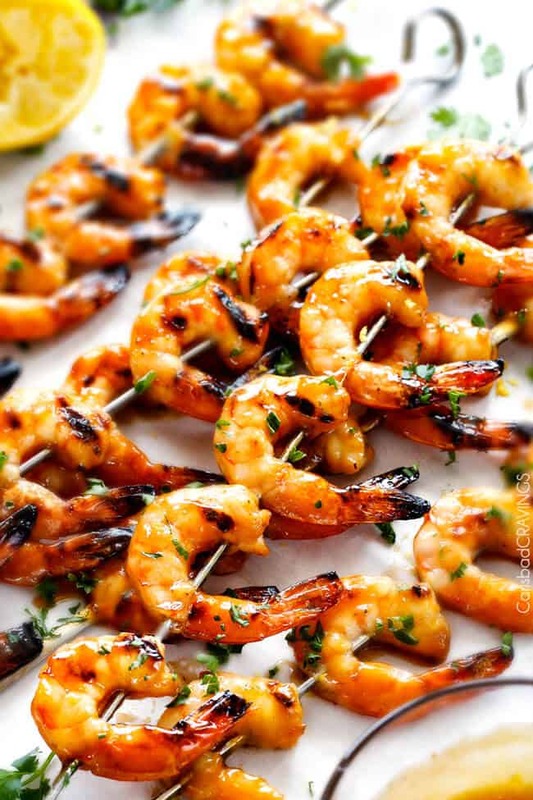 Grill: cook shrimp for 3-5 minutes on each side or until shrimp has become pink and opaque. Stove: cook shrimp until shrimp are bright pink and opaque, about 3-4 minutes. Don’t overcook your shrimp or it will be hard and rubbery. Just cook the shrimp until it is no longer pink. You’ll know you’ve overcooked the shrimp if the tail curls back onto itself. Sauce: You make the Honey Garlic Sauce simply by melting butter with your reserved Honey Garlic marinade and just 1/2 teaspoon cornstarch. Simmer away to let it thicken slightly. If you want spicier shrimp, simply add more Asian chili paste to the butter sauce or to your own portion of butter sauce – and then everyone is happy. And everyone is blissfully happy with one bite of these buttery, juicy, tender, sweet and tangy morsels. Want to try this Honey Garlic Shrimp Recipe? Pin it to your GRILL, or SEAFOOD Board to SAVE for later! This Honey Garlic Shrimp is the perfect quick and easy dinner for all those busy weeknights BUT it’s also delicious enough for company! It takes less than 30 minutes to make and 20 of those minutes is hands-off marinating time. All you have to do is whisk the honey lemon garlic butter sauce together and cook the shrimp! The flavorful sticky sauce doubles as the marinade so you get double the flavor without double the work. This Honey Garlic Shrimp is sweet, savory, spicy and buttery with an Asian ginger kick. I’ve included directions on how to grill this shrimp recipe or cook it on the stovetop because you are going to want to cook this juicy shrimp year round. Serve Honey Garlic Shrimp as an appetizer or as a dinner with rice and vegetables or make a shrimp salad out of it. No matter how you serve it, your family will LOVE this Honey Garlic Shrimp recipe! Whisk together all of the Honey Garlic Sauce/Marinade ingredients together except for the cornstarch and butter. Add 1/2 cup to a large freezer bag along with 1/4 cup olive oil, 1/2 teaspoon salt and 1/4 teaspoon pepper. Add shrimp to bag and massage to evenly coat. Marinate at room temperature 15-30 minutes or in the refrigerator for 60 minutes. Refrigerate remaining Sauce separately (this will be the base for your butter sauce). Add reserved Honey Garlic Sauce to a small sauce pan. Whisk in 1/2 teaspoon cornstarch. Add 4 tablespoons butter and heat, stirring occasionally, over medium heat until butter has melted. Bring to a boil, then reduce to a simmer until slightly thickened, about 3-5 minutes. Add additional Asian chili paste to taste. Brush shrimp with Honey Garlic Butter Sauce and use the remaining sauce as a dip. Delicious served with rice. STOVETOP DIRECTIONS: Drain and discard marinade. Heat 1 1/2 tablespoons olive oil in a large skillet over medium heat. Once hot, add shrimp and cook, stirring frequently, until shrimp are bright pink and opaque, about 3-4 minutes. Remove shrimp to a large plate. To the same skillet, add reserved Honey Garlic Sauce and whisk in 1/2 teaspoon cornstarch. Add 4 tablespoons butter and heat, stirring occasionally, over medium heat until butter has melted. Bring to a boil, then reduce to a simmer until slightly thickened, about 3-5 minutes. Add additional Asian chili paste to taste. Add shrimp back to skillet and toss to coat. Delicious served with rice. *Total time does not include marinating shrimp as this will vary. **If you aren’t sure how much Asian chili paste to use, start with 2 teaspoons and add more to the Butter Sauce at the end of cooking if you want it spicier. Hi Jen! I have been on a shrimp binge lately and picked up four pounds of frozen jumbo shrimp on sale last week for less than $20.00. Like you I never get tired of shrimp! These have me drooling on my keyboard! Along with a nice salad I’m calling it dinner! Whoa, that is an awesome buy – let the shrimp binge continue! I am so excited you are making these soon – please let me know what you think! I hope you had a fabulous 4th Dorothy! Like all your delicious recipes here Jenn, this is mouthwatering. 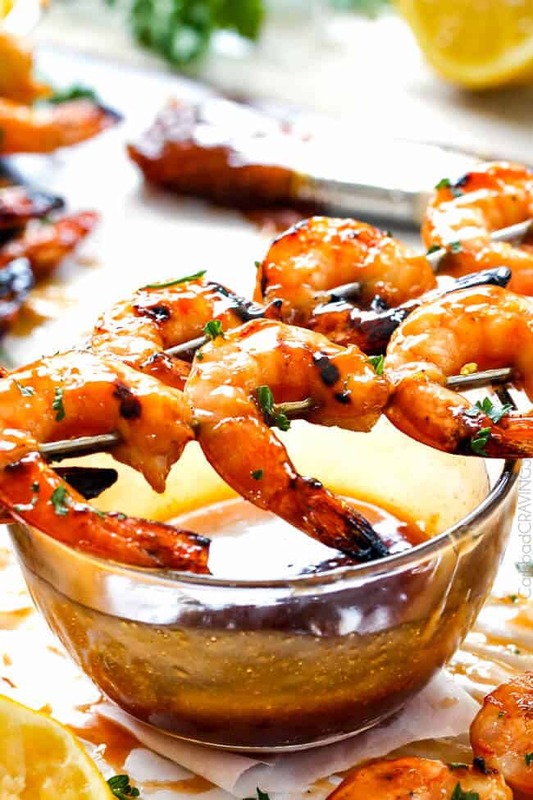 LOVE grilled shrimp, especially all sauce dup like this! 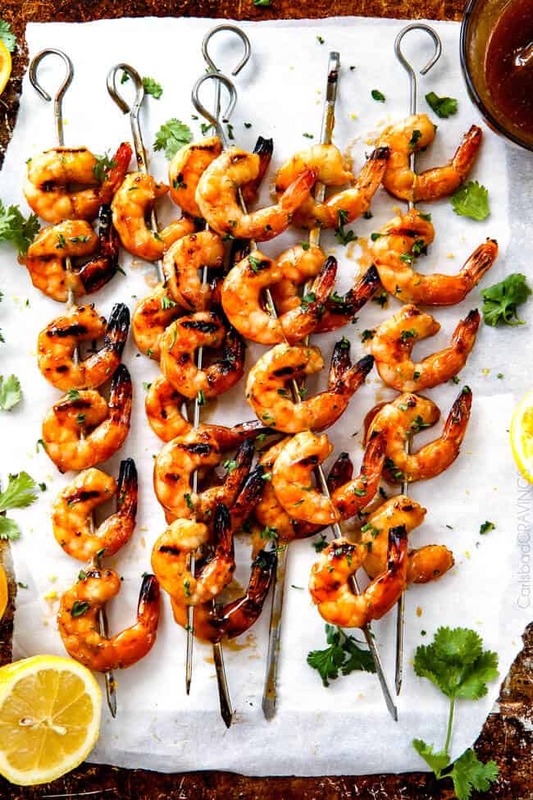 Honey, lemon, chili, butter… all my faves on this shrimp. 🙂 Great recipe! I feel like I should compensate you every time I make one of your recipes. This one was no different! I’ll admit I’ve never been a huge shrimp fan, but my husband is. So, I decided to make these for his birthday. My husband loved them…and so did I! 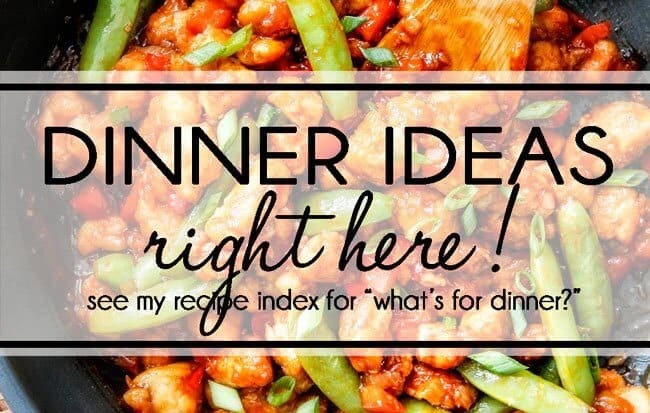 Amazing recipe…one I’ll definitely be making again! Thank you! hahaha! I just love that you leave comments and make me feel so good – that is the best compensation, so thank YOU! And you are so sweet to make your husband shrimp on his birthday even though you are not a huge fan- I’m so glad you both loved this – and hopefully you will be making shrimp more often! What can I substitute the Asian sauce with? I have sir siracha sauce……would that work? Absolutely! Sriracha will taste great! Enjoy!